I knew that it would be another tough day at the office filed with turbulence and strife. My commute is about an hour and felt a profound satisfaction that my hectic work day would start and end on my motorcycle. During my ride, I dwelled upon the end of winter and the beginning of a new season. As the sun peaks over the horizon and shares its warm vibrant rays, I realize that winter has retreated north. The scent of new life has permeated through the plains and mountains and one can almost smell the land coming alive from a winter’s desolate exile. The rivers are more vibrant, fed by melting snow and the birds chatter among the trees in an epic devotional of the miracles of spring. For motorcyclist living in a multifaceted climate, this time of year represents an open door to freedom which removes limitations to our ability to ride. The warm air and gentle breeze call us from afar to find new paths to places rarely visited. Motorcycling in spring is like waking up to find that one’s awe-inspiring fantasy has indeed become a reality. Seize the moment and ride. Find a new adventure, research the wonders of history in your backyard, visit a friend long-lost, and cherish the majestic environment that only spring can display. We are our own leading restraint in finding happiness in this world; don’t let any obstacle get in your way. Now is the time to leave the chaos of life behind and chase smiles and grins on black top covered dreams. We live a life of risk and rewards. Every day may be the last day but we are always planning for tomorrow. It’s a life of balance and one must never lose touch with rationale thought but an occasional jaunt living on the edge builds character. Find time to live and breathe the fresh air of an uncluttered mind. Focus on the Ride and let the road be your long-lost muse. Does Anyone Have a Motorcycle I Can Borrow in San Diego? Today I was stuck in traffic on a southern California highway. When traffic slows, that’s where my jealously rises. The 4 lane highway slowed into a parking lot and I found myself trapped in my 4-wheel cage. Then in the rear view mirror I saw one single headlight weaving through the traffic. Like a jaguar darting through trees, the motorcycle snaked its way between the ensnared autos. As the cycle split the lanes of the slow moving traffic, I wished that I could have the opportunity to ride that traffic gauntlet of death. From conversations I have had with locals in California, splitting lanes is not as dangerous as it appears. If done in a safe manner, the action can protect the motorcyclist from being in harm’s way. Think of it as being a proactive defensive rider who is guarding against being rear ended by a distracted 4 wheel texter. When you are between the cars, constantly moving forward, then you are sheltered from the rear by the cars surrounding you. So in actuality one can look at it as an action that reduces risk by taking risk. 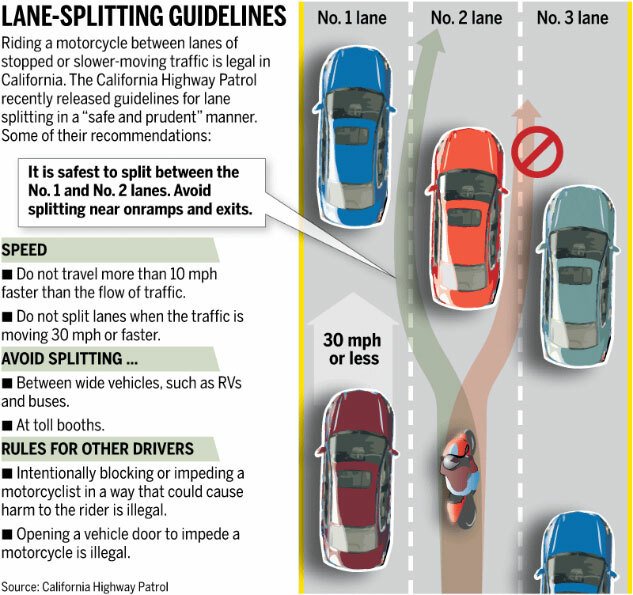 In California, splitting lanes is a normal part of doing business in terms of riding motorcycles. In Colorado, splitting lanes means a reckless driving ticket. I figure the smaller the cycle, the better it could be used to weave in between cars in traffic. With that said, I did witness a big old Harley Road King doing a good job of it the other day near Oceanside, CA. I don’t like the feeling of being jealous but I really wish I had my motorcycle here so I could attempt this majestic endeavor. The weather has been foul here over the last few weeks, so I have not had the opportunity to rent a cycle, plus my work schedule keeps me busy till dark. 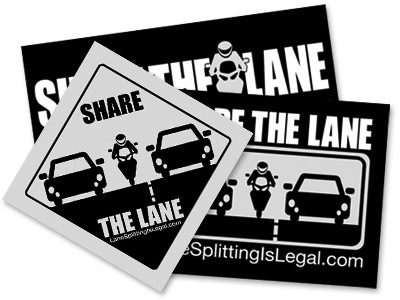 I think would be a bad idea to attempt my first time lane splitting at night during a rain shower. That scenario would lead to certain ugliness. I posted this photo a few days ago because I thought it was rather cool but while eating a bagel, I pondered the photo more in depth. 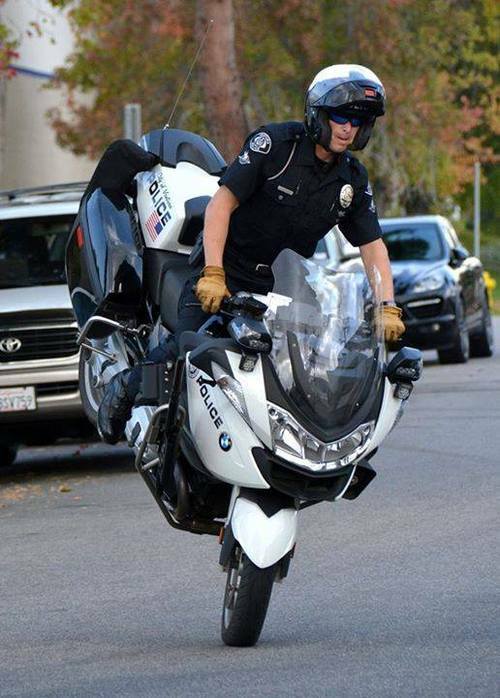 Would it not be radical if a few Police Departments had a Motorcycle Stunt Team? Ok, the idea would seem like a blatant waste of money. Well maybe not. Police Departments combat many issues. High crime rates, bad morale within the department and community relation issues. 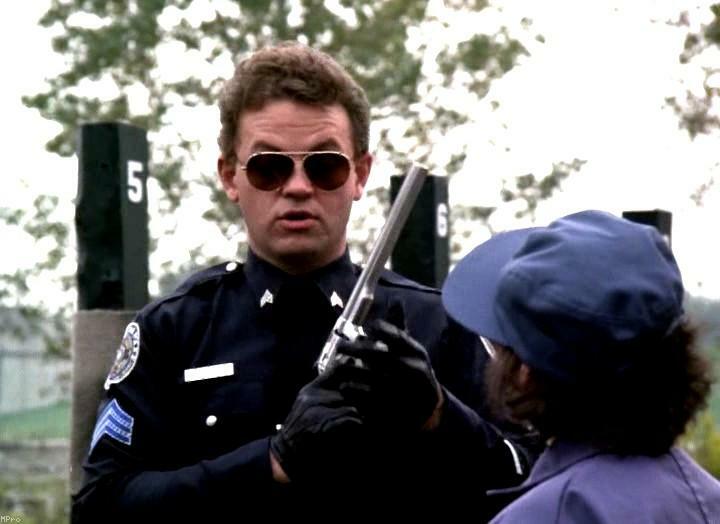 There are ton of reasons why people distrust the cops and some are valid and some are not. I guess what is important to me, is that the streets are safe. The streets will not be safe if the community does not have a positive relationship with its Police Department. That fact cannot be argued. So use the Motorcycle Police Stunt Team as a Community Relationship Program. There is nothing that brings the community and police together like having Officer Sgt. Tackleberry jump his Harley through a Ring of Fire. There is no end to the zany antics our Police Officers could do involving their policy department issued cycles. One thought would be “Police Officer Jousting” on bikes. Kind of like combining The Middle Ages with Evil Knievel Motorcycle Depravity. I’m just saying as a lover of everything motorcycles, I would trust The Police a bunch more if I saw them doing Stoppies, Wheelies and Death Loops every once in a while. It would make the Policy Officer seem more human and yes, more cool. But then again, I have the emotional maturity of a 7-year-old and have never met a motorcycle I did not like. So my judgment may be truly flawed.